VeeR OASIS is a premium VR headset introduced by VeeR VR, a leading global VR content distribution site. The virtual reality headset is specifically designed for an effortless viewing experience. Customers also receive prompt services from the VeeR team. Connect with VeeR and join the community on social media @letsveer! With this VR headset, you can easily enjoy virtual reality, anywhere and anytime in the world! 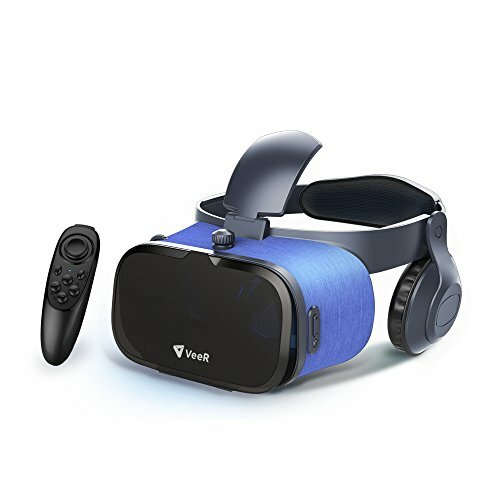 VeeR OASIS VR headset is compatible with most VR video apps. We highly recommend the VeeR app as your primary choice for viewing the most diverse and immersive set of VR/360 content from creators all around the world. Download the VeeR app on your mobile devices to shoot, share, and enjoy high-quality VR/360 videos! ✔ Experience the world in a different way. Let OASIS bring you a total different sense of vision. ✔ Design for comfort. Ultra light body and adjustable headband offer you richer viewing experience. ✔ Free high - quality VR content resource with VeeR VIP membership card which included in the package. ✔ Better control with VR remote. Available for all the Andriod devices, improve your watching and playing experience with the headset. Due to system limitation, remote functions for iPhone users are not guaranteed. ✔ Wide compatibility. Works with 4.0 - 6.2 inch smartphones. OASIS is an universal solution to viewing VR in all operating systems.